This guide aims to be a simple, easy-to-use security resource to help smaller NGOs demystify security risk management. By setting out the elements of a basic security risk management framework, this guide aims to support NGOs in translating their duty of care obligations into key processes and actions that will not only enhance their national and international staff security but also improve their organisation’s reputation and credibility. Although the guide is intended to be applicable to both national and international NGOs, some elements may be more relevant to one or the other. Many existing NGO security resources tend to focus on the requirements of larger humanitarian and development organisations, i.e. those with large multi-national staff teams working in multiple countries, often with dedicated security staff. 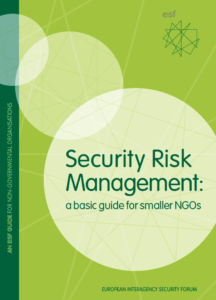 This guide is mindful of the limited resources and the specific challenges that smaller NGOs may face in trying to establish and maintain a security risk management framework. This guide complements other essential guides, such as EISF’s ‘Security to go’, which focuses on security management systems in a particular context or location; however, this guide provides a broader perspective on the overarching framework an organisation should aim to have in place in order to improve its security risk management. This guide also aims to complement the EISF ‘Security Audits’ guide, which enables organisations to take stock of what they have in terms of staff security and what needs to be improved.